Alina Florea is a former Romanian gymnast and National level coach (1993-1999). She coached Andreea Raducan, former member of the Romanian National Olympic Team and Olympic Champion in 2000. Andreea is currently the President of the Romanian Gymnastics Federation. Alina has a Bachelor of Physical Education and Sport and a bachelor’s degree in teaching. Certified as a NCCP Level III WAG coach, she has coached both provincial and national level athletes in Ontario since 2003. Alina built and managed a strong High Performance Program in Ottawa and counts many Provincial, Eastern Canadian, and even a National Champion amongst her athletes. The program developed by Alina ensures continuous development and success for her athletes. Alina’s athlete, Juliette Chapman, was recently the Espoire athlete for the Youth Canadian National team and obtained the Ontario Quest for Gold Sponsorship. Novice National High Performance athletes. Athletes ranked Top 8 in Novice National HP at National Championships. National Novice HP floor champion. National Novice HP silver beam medalist. Gymnix International, Canadian Pre-Novice National Elite level medalists. 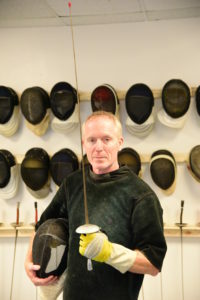 The RA Fencing Club operates under the direction of Head Coach Paul ApSimon who is a certified level 4 coach (ACD – Advanced Coaching Diploma) and currently is the coach for the Canadian National Foil Team. Paul was the team leader and foil coach for the 2000, 2012 and 2016 Canadian Olympic Fencing teams. He helped the women’s foil team to Canada’s first ever Gold medal in Women’s Fencing at the Pan Am Games in Toronto. Most recently, Paul coached Eleanor Harvey to Canada's best ever result at the Olympic Games: a seventh place finish. 2017 Canadian fencing coach of the year. 2015 Ottawa Sports Award Lifetime achievement. 2012 winner of the Queen Elizabeth II Diamond Jubilee Medal.